The wait is finally over. Farpoint has arrived and is a pretty big deal for a multitude of a reasons. 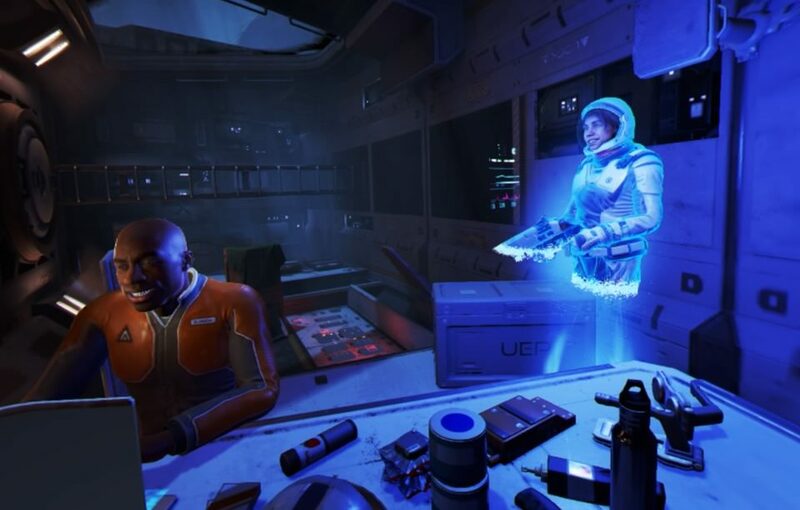 It’s a full length First Person Shooter that showcases how to bring the genre (almost) fully to VR. The tale before is a standard one; It’s the future, there’s an accident in space, a crash landing and an adventure. I won’t spoil any plot points past the initial 15 minutes or so, so fret not. Let’s get to the game. The cliff sides here are pretty wild to behold, just watch out for incoming enemies! 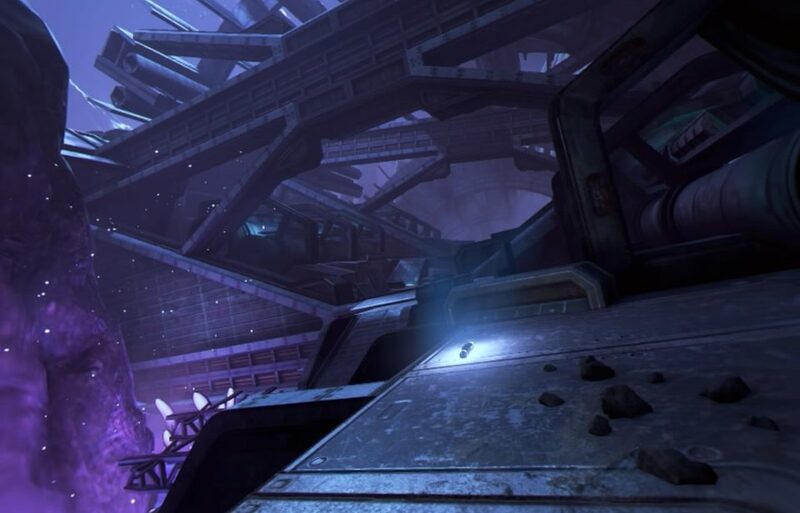 I can’t mention Farpoint without mentioning the control method it was built for. The Aim controller is a whole new way to play, placing all the buttons from a standard DS4 onto a controller shaped like a rifle. It’s amazing! While the new button placements do take a little time to get used to, holding a 2 handed weapon that tracks your real life movements in a shooter is amazing. When I looked down the laser sight for the time, I just laughed. The way this plays, you need to turn your whole body, feet and all, to make the shooting and movement feel comfortable. After a some mental adjusting though, it’ll feel pretty normal. You can play sitting of course, but it really is more comfortable standing, especially in some of the more intense battles. The other method of play is a DS4 controller. However, a classic dual stick control scheme is not used, instead the controller is tracked using the PS camera. It works decent enough, and if you don’t have an aim controller than this is a control method that will do the job, but it does feel unnatural compared to the aim controller. It is worth noting that there is no jumping in this game, which I assume was a decision to minimize sim-sickness. You only get a few guns in the game, but a few, more powerful, add-ons and attachments become available as you progress, so you’re not just stuck with a machine gun. The game looks good, but it does have a few shortcomings. Some of the textures viewed under close scrutiny fall flat. There is also some clipping, nothing game breaking, but I did notice it quite a bit. The environments you walk through and fight in a relatively small compared to many FPS’s, though this does add to the frenetic pace of some of the more intense battles. Backgrounds and distant objects look great, billowing smoke and far away mountains look amazing. Walk to close to a cliff and you may even get a little dizzy staring at the ground so far below. Enemies are gross and scary and up close are the thing of nightmares. The scope and scale of these levels in VR makes them a joy to behold! Thankfully the acting here is top notch and so are the ambient effects and soundtrack. With a good set of headphones your guns’ pop and positional sound is utilized fully. The only hint of an impending attack may just be a small squeak or some shifting dirt behind you. Surround sound headphones saved my life on more than once occasion and are a must for immersion. The campaign runs between 6 and 8 hours and is pretty fun. As you look for your lost companions, past events are told through holograms and flashback sequences. There is a mystery and story here worth checking out and though it starts out utilizing a few standard sci-fi and gaming tropes, the story does evolve nicely into an emotional tale but does leave something be desired at the games resolution. Other, more subtle nuances push this game into a realm of greatness, though that may simply due to the aim controller. Looking down the sites is fun early on, but latter levels(and weapons) require you to master that skill or risk dying…a lot. There is only one difficulty setting so if you get stuck, your only option is to try, try again. The first “epic” boss battle had me die probably 10 times if not more. This is easy sometimes and frustratingly hard at others. Latter levels were peppered with the same frustrations, though patience and developing skill will get you past the more difficult parts. An absolutely fantastic option is the multiplayer co-op and while it only gives you a few new, smaller levels and doesn’t change the game in any crazy way, bringing a buddy along increases the fun 10-fold as you fend off waves of enemies and progress to your pick-up point. Getting lit up? Take cover and reload while you friend cleans up your mess or resuscitate your fallen comrade and continue on with the battle. It’s a blast! The aim controller works next to flawlessly with the only time I had any real issues being when I sat down. My camera was just positioned a little to high forcing constant readjustment from sitting to standing. Truthfully, the game is better standing and after only moments of gameplay, I longed for a VR treadmill which would make this undeniably awesome. Staring down the sites also worked well most of the time, but on occasion tracking issues had my in-game gun position a little off making site shots awkward. Credit to the game designers is due as they managed to avoid the PSVR blind spots by having much of the action take place in front of you. It can be a little comical watching enemies move back within your visible range, but he frenetic action will keep you to distracted to really pay attention to that. Get used to these 2, you’ll be seeing a lot of them! Ultimately this is a pretty simple, stock shooter. No jump action and limited exploration force you to do what the game wants, and that’s not a bad thing. This is the first campaign based full motion FPS available on the PSVR and while it treads almost no new ground as far as the genre goes, it does the genre well with throwbacks to some of the classic games in the genre. It feels like part Halo, part Half-life and part Doom sprinkled with some Star Wars and Starship Troopers. 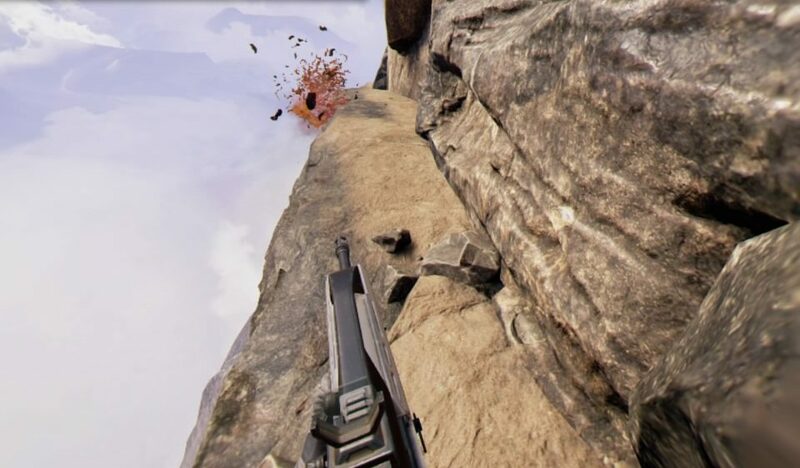 It may not be the most original shooter you have played, but in VR it’s still one of the most amazing. Coupled with aim controller, this is a must purchase for fans of the genre. What would I pay? $50US is great without or without the aim controller, but do yourself a favor and get the aim controller with it, it’ll save you money and can be used on a bunch of upcoming games. Score note: The score below represents Farpoint played with the Aim controller as it does improve the overall experience. The game with just a DS4 would rank closer to a 7/10.